Once upon an autumn weekend (I think it was around 1995), a fellow gardener and I planned to visit a nursery close to Salem, Oregon. I'd found a small ad in the local newspaper's classifieds offering native plants for sale. The idea of including natives in our gardens was novel and intriguing. I was sparsely acquainted with this genre, always looking for something new and different for my pampered garden, so it was with baited breath that we followed a gravel road which ended in the driveway of a large manufactured home. We had no idea what to expect but this definitely was not it. But the quaint hand painted signs and the little green cashiering building beckoned us to investigate. As we walked along the pathways between areas of shrubs and trees and perennials, we found old friends we had no idea were natives. We saw plants we had only noticed when hiking or taking a Sunday drive. A Piggyback Plant (Tolmiea menziesii) I had paid $15 for in a florist shop actually grew in the wild for centuries--amazing! I later learned the gracious gent was himself, Wally Hansen, and we were visiting his small paradise under the ancient oaks and firs. The home in whose driveway we parked sheltered Wally and his lovely wife, Audrey. In years to come a friendship grew and I came to care deeply for my dear friend, Wally Hansen. 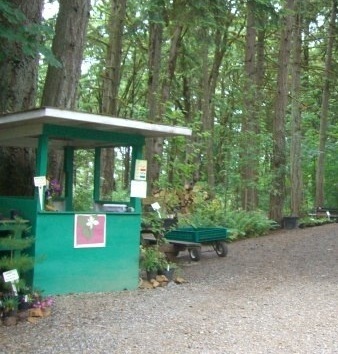 He was the master of this lovely garden and retail nursery growing just a little to the east of Salem, Oregon. There is much more to tell about the nursery and how our friendship grew, but this is how it began. As Wally often said, "Thank you and Good Gardening!"